There are a lot of little elements that, when they go wrong, can ruin a camping experience or backpacking trip. Eating is an important part of camping, and being unable to prepare your food can most definitely bring an early end to any trip. Your cookware is going to play a key role in how reliably you can do just that. So, we’re going to look for the best camping cookware on the market. We’ll try and help you realize what you need from them, and which Is the perfect option for you. We’re going to judge the following products on what qualities you should hope to expect from any camping cook set you buy. Beyond the simple features like how many pieces you get per set and what materials they’re made out of, we’re going to look at the real value of them. 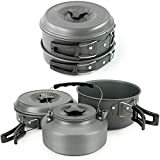 Non-stick coating, how well they conduct heat, how easy they are to clean; these are all factors that will dictate how usable your cookware is with a modern camping stove for instance. How long they last and how prone they are to damage can make a set much more reliable or it can make them a waste of money after one trip. Finally, we’re going to look at what unique advantages one set might have over the others and which kind of people they might be best suited to. Some might be better suited to campers than backpackers, for instance. Our first competitor is the Winterial Camping Cookware and Pot Set. This is a collection of eleven different items. It includes two large pots with lids, a frying pan, a tea kettle, a ladle, a bowl, one serving spoon, a cleaning sponge and a bag to carry it all in. Altogether, it weighs 1.5lbs and takes up 3.5’’ x 6.75’’ of space, the lightest of these three sets. All cooking pieces are made of aluminum oxide with a non-stick Teflon coating. It’s the least expensive item we looked at by a significant margin, close to half the price of the GSI Outdoors kit. Coated with high-quality nonstick Teflon. Not as good for larger camping excursions of more than three people. The Winterial collection makes a great, low-budget choice for those on more active trips involving one or two people. It’s good value for money, with enough cookware to keep any trip well fed. The small size and lightweight qualities make it perfect for hiking or backpacking, where every square inch of space counts. However, that strength is also a weakness. The pots are just about large enough to cook for one or two people, certainly no more. Though it takes a little while to heat up, aluminum oxide is a great material for carrying heat and will cook/boil anything you want it to. Our second competitor is the most expensive. The MRS Quick 2 System which sets the price midpoint for our comparison. There are two pots here of different sizes, a strainer lid, two deep dish plates, two stainless steel mugs, and one Talon pot handle. That’s eight pieces in total, two less than the Winterial. When it’s all put together, it weighs 1.95lbs and takes up 6’’ x 9’’ inches in space, meaning it’s also somewhat bigger and somewhat heavier. The cookware is aluminum oxide (packaged with the alternative name: hard-anodized aluminum) while the mugs are stainless steel. One of the pots (the smaller of the two) has a non-stick coating, while the other does not. As they are significantly larger, though there are less of them,the MRS set is clearly designed for more people. Though it still accommodates hiking and backpacking as opposed to just camping. The fact it can be cooked over a larger fire offers it an advantage over the Winterial set and the mugs are a solid addition. However, when it comes to value for money, it’s hard to justify paying more for a set that doesn’t have as many items, especially the bag and sponge of the Winterial set which are great for utility. Finally, we’re looking at the GSI Outdoors Bugaloo Base Camper. Of the different options available, we’re looking at the medium set. All sets contain the same pieces, just in different sizes so you can go large or small if you want. There are eight pieces in total, including two different sized pots, a frying pan, two nylon strainer lids, a cutting board, a folding pot handle and a stuff/sink sack. All cookware is non-stick thanks to the Teflon Classic coating and is made of aluminum. The lids and handles are made of heat-resistant material, however. Altogether, it’s the most expensive item we looked at, costing around double the price of the Winterial set. It’s also the heaviest, weighing 2.95lbs and when put together, taking up 5.4 x 9.1 inches of space. The priciest, heaviest, and largest of the lot, the GSI Outdoors kit is the highest quality set with plenty of options and a few advantages over its competitors in terms of convenience. However, that alone isn’t enough to justify the fact it costs double the price of the Winterial set. It is uniquely suited, however, for larger gatherings, with the ability to cook multiple pots and pans at once. If you’re inviting the extended family to camp with you and you’re sleeping not too far from the car, then it might be worth considering. Otherwise, it’s hard to see why you would choose this over the other sets. 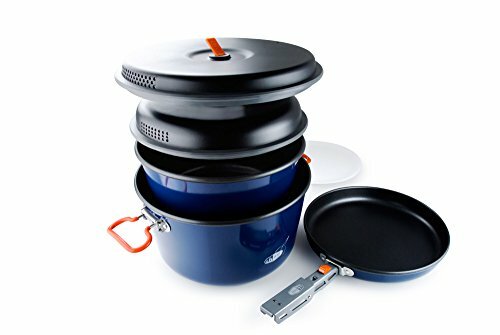 The best camping cookware your money can buy is the Winterial set. For backpackers, it’s easily the best choice given how compact and light it is. It might not be the best suited for larger camping groups, in which case you might want to look at the MRS Quick 2 System but for all others, the cost-effectiveness alone makes it the most attractive package to us. On the other hand, the GSI Outdoors is a quality cooking kit, it just doesn’t justify the price hike over the others. They all have the same flaws and the same strengths in terms of material, so it’s about thinking of the size of the group and how mobile you need your cook kit to be.